While nature mostly seems to be holding her breath now, just waiting for winter, there are a few exceptions to the rule of telling more by absence than presence. One is the Muskrat. Muskrats are on the move! Young of the year are moving out (have been kicked out, rather, to make room for new offspring in the spring) and dispersing across the countryside, often traveling a considerable distance to find unoccupied marshland territory. Many will not survive the journey, or the winter. Territoriality is one way nature keeps animals from overpopulating and exceeding their carrying capacity in one area. 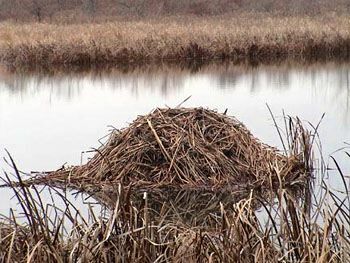 Muskrats are also building lodges – cone- or dome-shaped houses made largely of cattails and mud in shallow lakes. You can tell them from beaver lodges by their smaller size (max. usually 1m high and 1m across) and lack of woody construction materials. The lodge is built by heaping up plant material and mud to form a mound, and then digging out a burrow from below the water leading to a chamber in the middle. A second exit burrow is also dug. The walls of the lodge are then reinforced from the outside with more plants and mud. Being located in the water with water entrances and exits affords them protection from land predators. 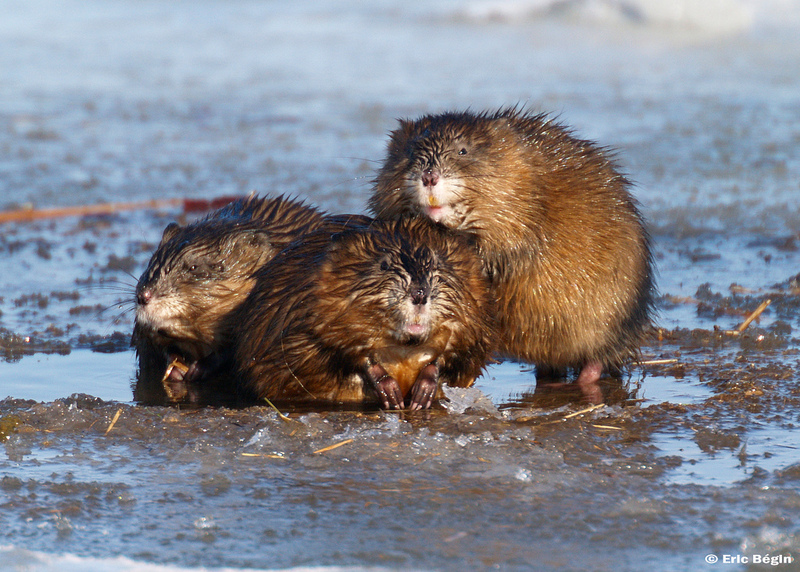 Muskrats also create dens dug into banks of deep lakes or ponds and slow-moving rivers and streams. After surface ice forms in the marsh, you can also look for pushups and feeding huts, but we will address those at a later date. Muskrats are connected to many parts of the ecosystem. 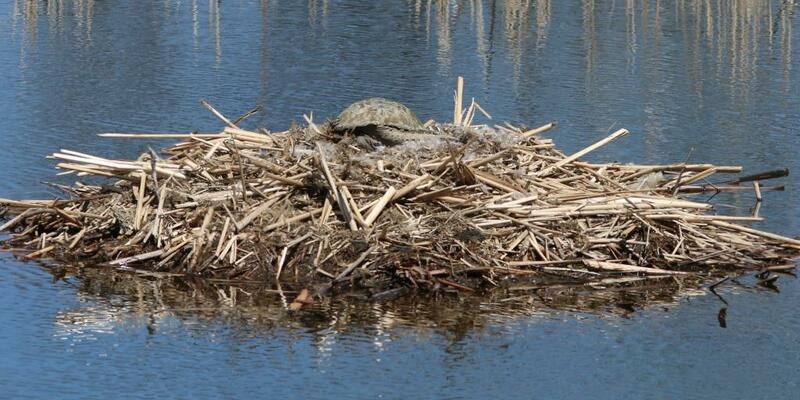 For example, their lodges are important places for ducks and geese to nest on, snakes and turtles to bask on…and sometimes both! Muskrats are herbivores, helping keep waterways clear, and sometimes eating so many cattails that they open up large areas of shallow water. They in turn are preyed upon by numerous predators such as Raccoon, Red Fox, Bald Eagles, Snapping Turtles, and Northern Pike. Now with all this Muskrat movement, I feel inspired to get down and do a little Muskrat Ramble of my own! Those scaup we were so concerned about in mid-October are among the last ducks to head south. While some may hang around lakeshores for a while longer, most are now on their way. Also departing are Red-tailed and Rough-legged Hawks, although some of both may stay on through the winter. The Sharp-shinned may be Canada’s most commonly seen winter hawk. On a good day in November, hundreds of migrating hawks can be seen moving along the north shore of Lake Ontario. Project FeederWatch is beginning for another winter season. Join as a class or as an individual, learn more about the birds in your neighbourhood, and contribute to citizen science! Winter “sleepers” begin to retire. The occasional spate of warmer weather may have kept some critters active longer than normal – I saw Chipmunks running around my yard not long ago – but one blast out of the north may be all it takes. These are not true hibernators, and warmer winter days may find some of them out and about. Chipmunks will retreat below ground to at least a three-room pad: one room for sleeping, one for food storage and eating, and yet another for defecation. Skunks and Raccoons don’t store food, but rely on body fat while sleeping for extended periods. 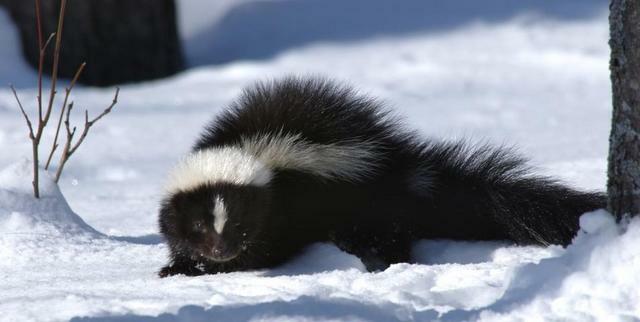 Skunks are more active than raccoons during winter. 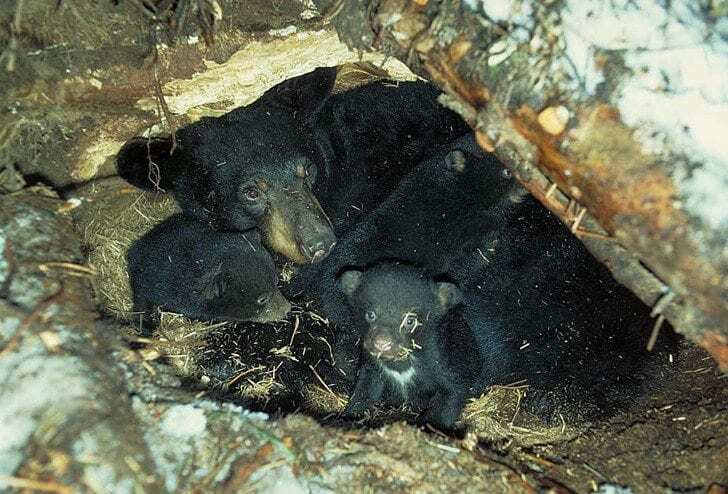 Black Bears will dig out a den, use a brush pile or rock crevice, and may even sleep in the open with nothing but a pile of grass or evergreen branches between them and the ground. Since they are not truly hibernating, their temperature drops only a few degrees, but their heart rate can slow to 8 beats per minute. Snowshoe Hares are turning white now to match the coming snow. Usually, the ears and feet turn white first. Hares are usually all white, except for the tips of their ears, by early December. Snowshoe Hares rely on their camouflage to avoid predation; however, with climate change their future is uncertain. 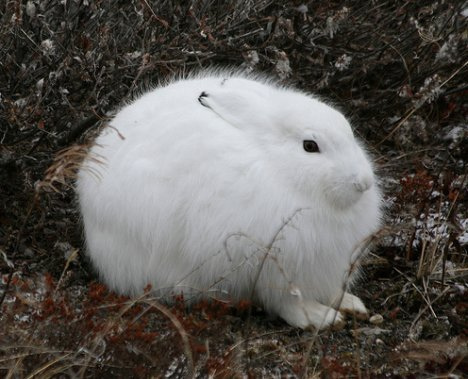 Day length signals a change in coat colour, but with less snow in the spring and fall Snowshoe Hares may be white against a brown background. “Where have all the flowers gone…” Just when you thought they were all gone, Witch Hazel decides to bloom. The petals have the unique ability to curl up in a bud when the temperatures drop and unfurl in the warming sun. This adaptation protects the nectar and pollen for warmer days when insects will venture out again. 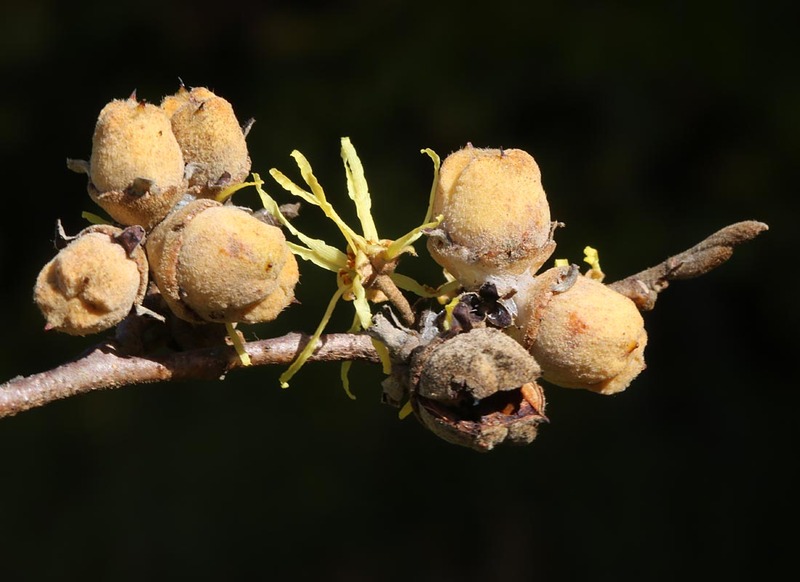 On the same branch, you may also find ripe seedpods from last year that will explode and scatter seeds up to 10 metres. Our sensory palette adjusts to appreciate the smaller splashes of colour that remain. Ferns such as Christmas Fern, Rock Polypody, and Marginal Wood Fern offer up green, as do mosses such as sphagnum, Juniper Moss, and Shaggy Moss. Ground Pines look like miniature green trees, which will release little puffs of yellow spores this month when your foot brushes it. 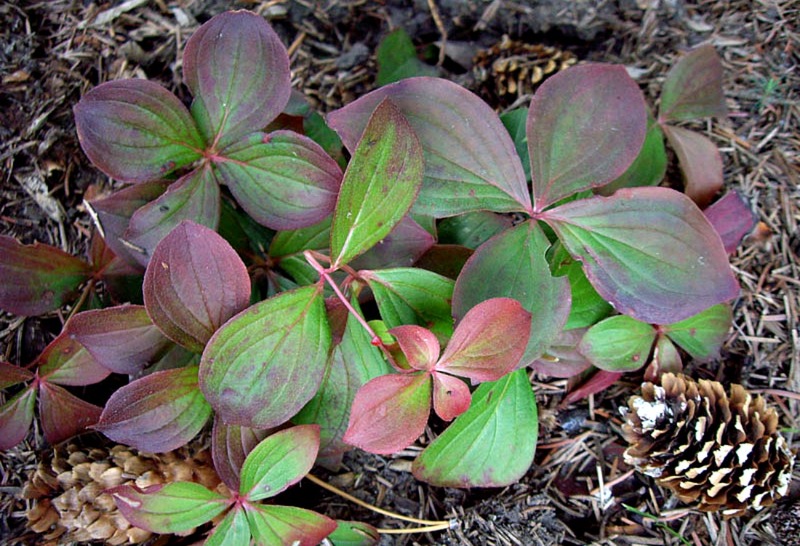 Trailing Arbutus, Pipsissewa, and Patridgeberry are a few of the flowering plants that remain green, while Buncherry leaves go purple. 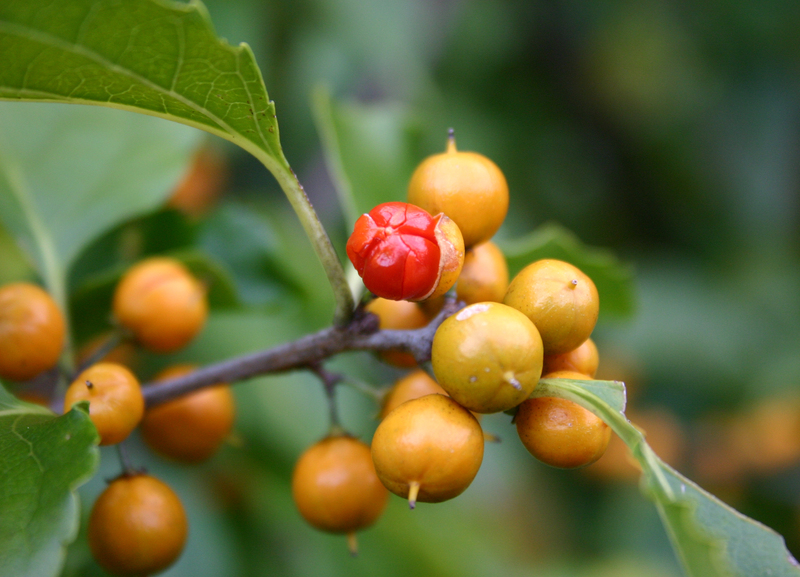 Wintergreen berries are bright red, and Climbing Bittersweet (native) and Oriental Bittersweet (not native) provide orangish-red fruit (watch out – they’re poisonous). Take a ‘fall colour’ hike, and discover the colours left in your area once the leaves leave. Orion, one of the most identifiable constellations, has joined us to the southeast in the night sky. Harbinger of winter, he will watch over us for months, finally ‘setting’ to the west as spring arrives. Stellarium is a free planetarium for your computer, allowing you to introduce a realistic 3D night sky in the classroom. In the evening to the southwest, the moon leapfrogs Saturn between the 10th and 11th, and pairs up with Mars to the south on the 15th in particular. Two meteor showers grace the sky during mid-November. The North Taurid peaks around midnight on the night of November 11/12, while the Leonid is best (10-15 meteors per hour) between midnight and dawn (naturally) on November 17 (less moonlight) and 18. Those scaup we were so concerned about in mid-October are now leaving. Some may hang around the shores of the Great Lakes for a while longer, feeding on Zebra Mussels. Also departing are Red-tailed and Rough-legged Hawks, although some of both may spend the winter here. In fact, Red-tailed may be the most commonly seen winter hawk in many parts of Canada.